Corsair launches in Computex 2018 a new SSD in compact and fast M.2 NVMe PCIequi is affordable, the Corsair MP300. 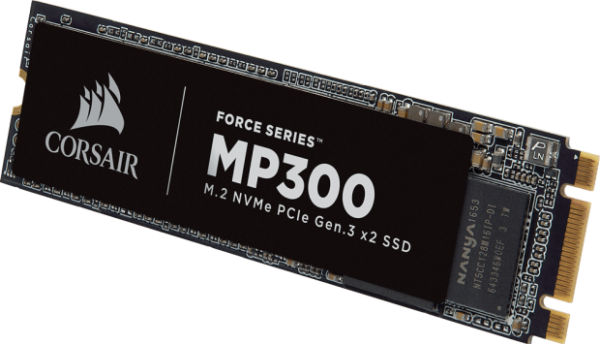 The new 5-year-old Corsair MP300 Solid State Drive adopts a compact M.2 2280 NVMe PCIe (2 lines instead of the usual 4 of the NVMe) Gen3 and weighs 5.5 grams. It is based on a 3D TLC (Triple-Level Cell, 3-bit) NAND flash memory whose engraving fineness is not communicated like the on-board controller. Regarding tariffs, the new SSD Corsair MP300 is positioned as an affordable model at 49.99 dollars in version 120 GB, 79.99 dollars in 240 GB version, 149.99 euros in 480 GB version and 319 dollars for 960 GB.